When it comes to The Write Reviews, Noah Yount is an emcee who has become very well respected. His two album reviews last year scored 4.5 out of 5 stars each, landing him several nominations at The Write Awards this past April. Currently residing in Japan, the Wisconsin-born artist stole the show at the awards ceremony when he walked away with some of the most prestigious trophies, including Best Album of the Year and Best Male Artist of the Year. The consistency shown in Whuddisay and Renaissance Man has matched by only one other artist in the history of reviews published on this website. 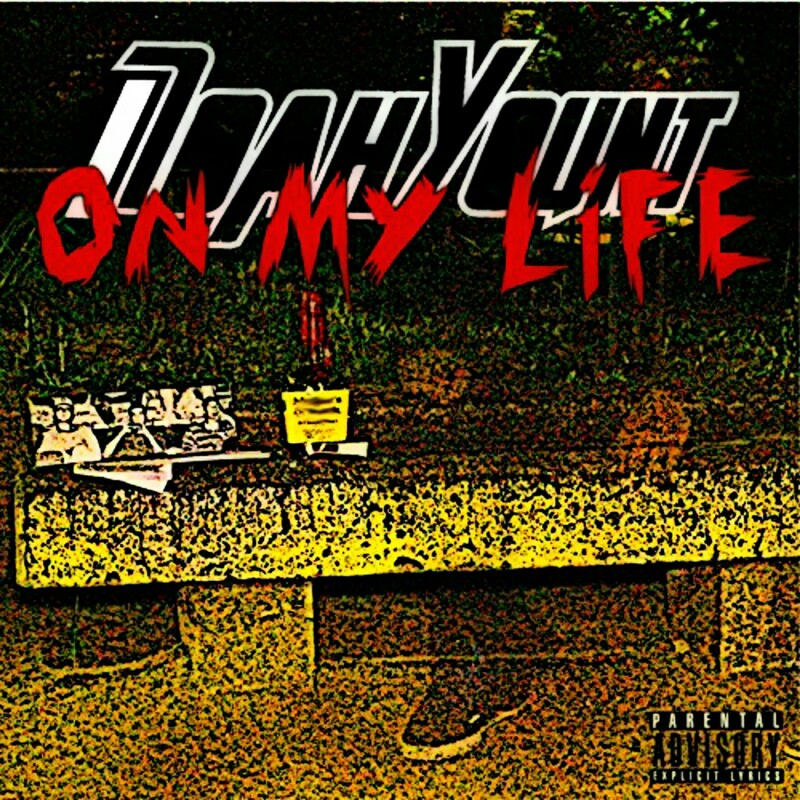 Will Noah Yount’s reputation stay intact after this breakdown of his On My Life album, or has that reputation caused the emcee to become complacent instead of hungry in his pursuit to be recognized as one of the best to ever bless a microphone? Follow the above link and listen along as I break down Noah Yount’s On My Life. Noah Young opens the album with a hook that’s catchy as hell, which is something that has become expected of him. This track is worthy of radio play but isn’t likely to get the love from stations because of the title alone. Noah switches of his delivery and the speed of his flow throughout the track, transferring between the styles with ease. This is a great opening track for On My Life, and a simple choice for the first Featured Track of the album. The intro to “Hungry” puts the song into perspective before the instrumental begins playing. Noah’s delivery matches the mood of the music and brings a contagious intensity that will be enjoyed by the audience. Everyone should be able to relate to the subject matter, which pertains to the desire to be successful. “Hungry” has no trouble being the second Featured Track of the album. Nearly every emcee has dropped a song about smoking some tree, which makes it difficult to stand out from the crowd. Noah Your is able to make that happen by choosing an instrumental that’s laid back and fitting of such subject matter. He opens with a catchy hook and a delivery that matches the rhythm of the music. Noah speaks about the evolution of smoking in his life, and how some things have changed while the basics have stayed the same. The audience will move to the music and sing along with the chorus before finishing their first listen. Three songs on the album, we have three Featured Tracks. This is another song that listeners will have a hard time breaking free from after the track has ended. While the track is well written and solid from top to bottom, I feel the autotune is too excessive here. Personally, I believe it kills some of the emotion that Noah is pushing through the speakers. Otherwise, this track continues the streak of solid songs so far. I’m a huge fan of originality and blending creative forces. While the concept for “My Sh*t” may not be entirely original (see Worldwide Choppers by Tech N9ne), combining an American emcee and Japanese emcees all speaking in their native tongues is rare enough to be considered as such. Jin Dogg and Young Yujiro bring their own flavor and style of delivery while rolling with the flow of the track. Both featured artists tie a little bit of English into their verses and Noah Your switches from his native tongue to spit some Japanese lyrics as well, assisting in bringing some balance throughout the song. I wish I knew Japanese well enough to see how Jin Dogg and Young Yujiro approached the track lyrically, but I don’t feel my lack of knowledge should count against anyone else, which means we have another Featured Track for On My Life. When he wants to, Noah knows how to deliver a track that causes anyone within earshot to move with the music. “On Fade” is just one of many songs that fall into possible radio hits for Noah. Deciding to go with a less lyrical approach and a rapid fire delivery in the verses, Noah gets straight to the point. The hook is contagious. On My Life has another Featured Track to add to it’s list. The instrumental has a clearly methodical rhythm to it, which is a great base for a freestyle. Noah doesn’t break the flow during the entire freestyle, but he doesn’t switch the speed or the delivery in any way. Lyrically, Noah’s content made sense, included some imagery, carried a pretty diverse vocabulary despite the rather short time frame, and was loaded down with rather basic multiple syllable rhyme schemes, albeit rhyme schemes nonetheless. Noah brings everyone back to the album with the title track of the project. Dropping another track that has radio potential, Noah puts it on his life that he’s on his way and he’s bringing his supporters with him. The delivery is hypnotizing, locking in the ears of listeners as the lyrics lace themselves within the sounds that collectively create the music. The positive message may not feel as positive as the vibes of other tracks with the same message, but the message is there just the same. On My Life gets another Featured Track added to its already extensive list. Honestly, I don’t know how Noah does it. He has a knack for taking any topic and putting together a song on that subject that is worthy enough to compete for airtime on the radio. One of the shorter songs heard on the album, “Wastin’ My Time” draws the audience in quickly with its lyrics and makes them move to the music almost instantly. During the second half of both verses, Noah delivers his lyrics with the quickened cadence of the beat, which causes everything to feel intense before hitting listeners with a call, cool chorus that defines contagious. Make no mistake, On My Life is swinging for the fences as another Featured Track gets locked into the list. The instrumental has a great feel to follow the mood created by the previous sound heard on “Wastin’ My Time”. Don’t get it “Twisted”, Noah Yount has paid his dues, earning a place in the hip hop ranks, and if you’re an emcee coming to the mic without a message, then Noah explains how you don’t deserve anyone’s time. “Twisted” is nothing short of a solid contribution to On My Life. The idea behind “Noah Makes The News” isn’t entirely original, but the actual content very well could be. Basically, two friends argue about Noah’s credibility and ability as an emcee. By the end of the back and forth session, both friends agree that Noah Yount has solidified his spot as one of the most talented and realest emcees to touch a microphone. The creativity and delivery alone are worthy of making “Noah Makes The News” the next Featured Track for On My Life. If you aren’t able to figure out what M.I.A.D. stands for by the end of the song, I’ll go ahead and tell you it is an acronym for Music Is A Drug. Noah Yount decides to bring back the auto-tune and approaches the track with a sing-song approach. Without question, Noah sets the mood for the track. Pro Pittman delivers a great round of bars, using his rough voice and heavy delivery so listeners can easily distinguish who he is. Another round of the chorus from Noah concludes a solid addition to On My Life. An instrumental that will influence the audience to move to the music coupled with a catchy hook from Noah starts off a track that seems to be another hit within the first few seconds. Anyone within earshot of this track should have no problem being able to relate to the lyrics, which are centered around grinding it out to succeed and hard work paying off in the end. After two verses that stick to the subject in an obvious manner, Noah closes out “Diamonds Out The Dirt” with another round of the chorus, and another Featured Track for the album. The next-to-last song on the album is where we find Noah Yount becoming painfully personal. “Freddy Kruger” also has another nice change of scenery for On My Life, which is the format of the track. The songs begins and ends with the hook, while the meat of the song is one extra long verse between the hooks. Even though he speaks on some personal matters and situations, Noah still brings a delivery that makes listeners want to nod their heads. The Featured Tracks just filled its tenth slot for On My Life. The last song of the album gives listeners another dose of Noah Yount using a plug in to change the sound of his vocals. Have I mentioned the uncanny ability Noah has to drop a contagious chorus? Well, Noah has the uncanny ability to drop a contagious chorus. There should be no problem finding listeners that will be able to relate to the content heard on this track, either. The title of this song could lead people to believe Noah is going to spit lyrics about everything he wants in life, but that isn’t the case. Instead, he speaks on being free and having a choice. Some people believe those freedoms are slowly being taken from us before our very own eyes. “What I Want” closes out On My Life with its final Featured Track. Get your copy of Welcome To My Mind LP by Enkay47 here. Goddamn, Hungry, Whole Oz., My Sh*t, On Fade, On My Life, Wastin’ My Time, Noah Makes The News, Diamond Out The Dirt, Freddy Kruger, and What I Want. If there was any question about Noah Yount’s consistency, that question has been answered. On My Life has something for everyone, meaning the album can literally be enjoyed by toddlers, the elderly, and anyone in between. There isn’t a bad song anywhere on the album. Even if you are someone that despises auto-tune as much as I do, you have to admit that every track is executed extremely well and Noah seems to deliver each song exactly the way he had envisioned it. While the album doesn’t have any true faults or horrible songs, there are a couple of areas I feel are lacking or are not up to the standards that Noah has set for himself with previous albums. Lyricism was probably the biggest area I felt he wasn’t on the same level as he displayed on Whuddisay and Renaissance Man. It isn’t even his wordplay and metaphors, which he leans on less than earlier records, but his punchlines are far and few between on this latest release. The multiple rhyme schemes are practically flawless, and his flow is as perfect as it could possibly be. From top to bottom, On My Life is as close to a classic album as it can possibly be, right up there with his Renaissance Man record. If his consistency has proven anything at this point in his career, it has proven that Noah is due to drop a classic album any time now. Don’t be surprised if Noah’s next project is a collection of hits that Dr. Dre would be proud to co-sign himself. Noah Yount would like you to join him on Facebook and Twitter!